Posted on April 29th, 2016 by Jacob. This might go without saying, but wherever possible, film in the room or area with the least background noise. The chances are if you can hear it so can the camera. Even the best cameras’ standard microphones struggle to get decent sound if you’re on the other side of the room, you can combat this by sitting closer to the camera and projecting your voice. Most mobile devices have a voice-recording app included as standard, if you’re up for a bit of synchronising later on, you can set up a second device to record the audio and edit it to match the video later. 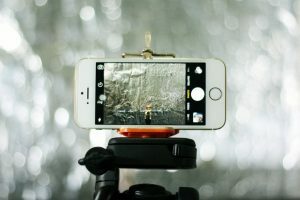 External microphones are available for most mobile devices for varying prices; if you’re planning toÂ film more than one video with your phone it’s advisable to consider investing in one of these.